For over 50 years, Bob Moore Auto Group has been taking care of customers and treating them with the respect that they deserve. We value our customers as family members and through our core values – Respect, Honesty, Integrity, and Trust – we have become a trusted automotive dealership in Oklahoma City. As 1 of the 15 car dealerships within the Bob Moore Auto Group, we continue to represent the gold standard for automotive dealerships in Oklahoma City and the Texas, Arkansas, and Kansas region. Audi Oklahoma City is a brand new state of the art sales facility, state of the art Service Center, and an exceptional Finance Center. These are a few of the reasons Audi Oklahoma City is the #1 Audi dealership in the state. 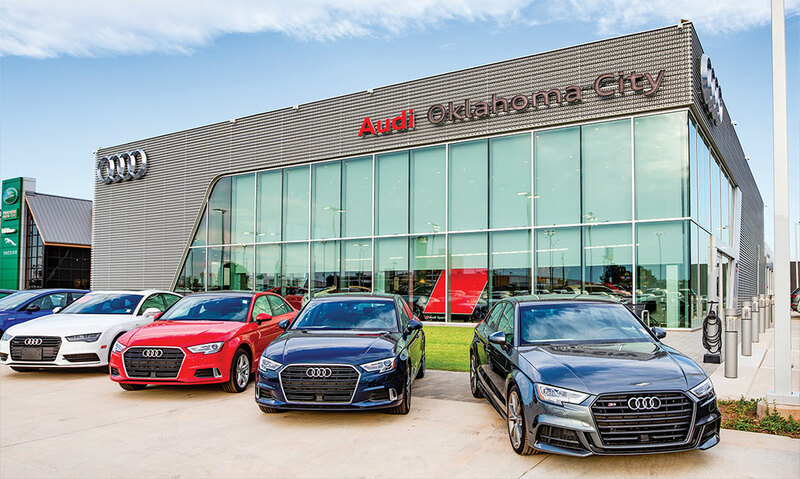 The Bob Moore Group has the largest used car inventory in the state, and Audi Oklahoma City has the largest selection of New Audi’s in the state. Come down to Audi Oklahoma City today for all your Audi needs. At Audi Oklahoma City, we have the states largest selection of New and Used Audi’s to choose from. When you come to purchase or lease a New Vehicle our Audi Brand Specialist will be honest and straightforward. Whether you’re looking for a compact sedan like the Audi A3 or a larger SUV like the Audi Q7, you are sure to find exactly what you need for your lifestyle. We have an inventory full of used and Certified Pre-Owned Vehicles to choose from. Our Certified Pre-Owned Audi vehicles go through a rigorous inspection process and are offered with our 5 Year Unlimited Miles Warranty. Along with the latest Audi models, we carry used cars, trucks, and SUVs from a variety of exceptional manufacturers as well. We are your trusted Audi dealership for used cars in Oklahoma City. Drop by and speak with our experienced sales staff today. Financing can be a scary and confusing situation when buying a new car. Luckily, here at Audi Oklahoma City, we have a knowledgeable team of finance professionals to help you through the process. Our staff will treat you with the utmost respect and assure that you find the right Audi Finance Option for your budget. You can choose to start the finance process online by filling out a brief Finance Application or by simply calling our expert Audi finance center. You can also check to see how much your trade-in would be with the KBB® Cash Offer Tool. There is no better place to find out about Audi finance options than our professional finance center at Audi Oklahoma City. Visit your premier Oklahoma City car dealership today. Visit us today and find out why Audi Oklahoma City is the best place to go when your Audi needs a tune-up or a major repair. We have an up-to-date, fully staffed service center as well as a state-of-the-art Collision Center. Our trained technicians are prepared to get your Audi in perfect working condition. They can keep it that way, too, through precise, manufacturer-recommended maintenance services. From auto repair needs like oil change service to new tires to more extensive bodywork, we’ve got you covered. We also have a Parts Center stocked with a large inventory of original equipment manufacturer (OEM) parts specifically designed for your Audi vehicle. Plus, if you have any questions pertaining to a specific part, our service staff is always prepared to answer them. Schedule Your Next Appointment with us online or give our service staff a call if you have any questions. Keep your Audi in good hands at your trusted car dealership in Oklahoma City, OK. Here at Audi Oklahoma City, we want you to feel like you’re a part of the family. For over 40 years, we have been setting the bar for Oklahoma City car dealerships within the region and we have no desire to stop. Come by today to find your next new or used Audi car or SUV in our extensive showroom. Our sales staff, finance professionals, and service technicians are waiting to help with whatever you may need. Stop by Audi Oklahoma City today.